Waiting for a momentary lull in the sleet to try and get home dry, I while away a few enjoyable Friday evening minutes on Chain Factor. It’s a simple but fairly engrossing idea: you drop discs with a number on them into a grid. Whenever the number on a disc matches the number of discs in the row or column that disc is in, it will disappear. This is true not just for the disc you’re dropping, but the discs which are currently on the board as well. This makes it one of the more cerebral make-blocks-disappear games out there, since there’s no time limit, no need to find the right disc to match with, just the ability to think ahead and to count. Recommended, certainly until the snow stops. This Mario game clone is remarkable for its breath-taking, capricious unfairness. Watch in awe as over the course of seven painful minutes, the player dies time and time and time again through completely unguessable, hilarious obstacles. Awesome. This game (which you can play in your browser) is simple and brilliant. It works best if you know nothing about it before you try it out, because that way you’ll get a fantastic “Aha” moment when you suddenly realise how to do it. So I’ll say nothing except, enjoy. Video games are generally kind of continuous: you have to keep running/driving/flying/shooting all through the game, and if you stop controlling it, Bad Things happen. But if you’re as phenomenally lazy as me, this is likely to feel more like work than play. Surely there must be games where you can do less than this but still have fun? Quite coincidentally, in the last couple of weeks, I’ve come across two examples, both of which reduce their game play mechanics down to just a pleasingly effortless single mouse click. Coloured dots drift across the playfield as in, say, Asteroids. You have one click to set off a chain reaction which must consume a certain number of the coloured dots for you to progress to the next level. So all you do is watch and wait for enough of the dots to seem as though they’re about to converge, and then… click. That one click either will or won’t be enough to set off enough of a chain reaction; all you can do then is watch and wait to see if it does. It’s immensely soothing, especially on the higher levels, where, if we’re honest, there is as much luck as judgement. It’s more of a toy than a game really, and it inculcates, in me at least, a fairly zen approach; this click either will, or won’t work. Either way, it’s good. Peggle (14MB download; Windows only) is in some ways similar to Boomshine; again, you click just once to initiate events and then all you can do is watch to see what happens. This time, your task is to aim and drop a ball from the top of the screen to bounce off, and thus remove, as many orange pegs as you can. You have ten balls per level; if you remove all the orange pegs before you run out of balls, you go on to the next level. If not, game over. If Boomshine is like a calm pool of water, Peggle is a bunch of kids hopped up on ice cream and fizzy drinks, playing in the sea. It’s the Scissor Sisters to Boomshine’s Saint-Saëns. It’s bright and shiny, with lots of plinking, bouncing sound effects, like a pinball or a Pachinko machine. It’s incredibly simple (even very small children can easily play and enjoy it) and yet also strangely addictive; a few weeks ago, MSNBC named it one of the five most addictive games of all time – right up there with World of Warcraft and Tetris. It’s a giddy, exuberant confection; when you finish a level, the game goes, frankly, bananas with paroxysms of excitement and joy, and who can resist a game that’s more pleased even than you are when you win? Another day, another chance to fritter away the hours on a clever puzzle game running in Flash inside your browser. Today it’s Bloxorz, a devilishly simple idea where you have to move a 2×1 block around a grid until it can fall down the exit hole. The cleverness is in the way the block moves; it tumbles over and over, so if it’s standing up, when you move it it will “fall” until it’s lying down, and vice-versa. But if the block or any part of it goes off the edge of the grid, you lose, so you have to figure out the right way to manoeuvre the block to get it to the exit without falling off. Sounds fiddly, but it’s completely intuitive once you try it. There are extra complications such as switches and such-like, but they’re really just ways to extend the “land on the right square” idea. One feature, though, where your block is split into two and you have to move the two parts independently for a while, then bring them back together, is quite fun. So far, most levels have been reasonably do-able with a bit of lateral thinking, though 17, 18, 21 and 22 all looked unsolvable for a while until the lightbulb went on. If anyone gets all the way to the last level (level 33) without having their brain melt at least once, I take my hat off to you. Another game with dangerously addictive properties. In Slitherlink your objective is to draw lines around boxes with numbers in them. The number in a box represents the number of sides of that box which must have lines round them, so it can range from zero to four. There are usually empty boxes on the play-field too, and it doesn’t matter how many lines there are around an empty box. But as well as satisfying the number constraints, you also have to satisfy the rule which says that you must create a single line which has to be unbroken and continuous, with no loops or dead ends (isn’t there a term for a line like that, topographically speaking?). I’m slightly at a loss to understand why I like this game so much. Generally, I don’t like number puzzles or logic games. But I do like “action” puzzle games like Tetris. Perhaps it’s the way that SlitherLink sort of resembles an action puzzle game (none more than my own PipeMania, perhaps; maybe it’s just sub-conscious ego!) even though it’s really a logic/number game. Or perhaps it’s because the puzzle is spatial rather than purely numeric. Anyway, I recommend it for a quiet brain teaser for a few minutes. Engrossing, strategic, addictive. Not like any other Flash game I’ve tried. I love the visual style of this teaser footage for a (forthcoming? concept?) game. I can’t remember ever seeing anything quite like it. Earlier this year I was interested to see that in Japan there are Nintendo DS games whose aim is to improve mental agility. Now that one of these games has been released in this country my interest has turned to annoyance with the discovery that the wretched game thinks that my brain age is 64. Interestingly, the tool the game uses to measure your brain age is the Stroop effect (though it doesn't call it that): the game prints a series of words where the word is the name of a colour, but is printed in a colour which may or may not be the same as the named colour. You have to say the colour the word is printed in, not the colour it names. And I do mean 'say': the game does speech recognition, and for the limited case of naming colours, seems to do it perfectly. Since the optimal age is 20, this suggests that I have some way to go before my brain has been exercised sufficiently, or that the cartridge has some way to go out of the window if it doesn't shape up and start giving me a more plausible rating within the next week. On the up side, the games are immensely fun to do, so if I'm (mentally) working out and having a good time too then what's not to love? Cabel Sasser writes insightfully about a new game for the Nintendo DS called Brain Training. Actually, I say "game" but I'm not sure if that's really the right word; it's a way of using your handheld console to do mental exercises. Most importantly, though, Brain Training is doing what Nintendo said they would do but nobody really believed them on: opened gaming up to a whole new generation of players. Seeing grandmothers on the train holding their Nintendo DS like a book sends an instant signal — "brain training in progress". I'm looking forward to the US release of this so I can try it for myself (and hooray for non-region-locked devices!). A year or so ago, I had a chance, briefly, to try out a Sony PSP and a Nintendo DS. Both handheld game consoles, but they couldn't have been more different. The PSP was – and is – a gorgeous piece of hardware which looks great, feels great in the hand and has a beautiful, bright widescreen display. Like the best of Sony's designs over the years, it feels as though it's been beamed back in time from about five years in the future; it's the iPod of consoles. Nintendo's DS, on the other hand, felt as though it had been beamed forwards in time about twenty five years; it looks and feels like it was made by Mattel in about 1980; it's big and clunky and if someone showed you the two of them side by side and asked you which one you wanted, you'd have to be insane to pick the DS. And yet shortly before Christmas, I bought a DS. Am I insane? Not for that decision, at any rate. The trouble with the PSP is that it lacks the one crucial thing a console needs; good, distinctive games. There are games which look great when you see them running – Ridge Racer, for example – but the overwhelming majority of the PSP catalogue is stuff which has endlessly been done before – first person shooters, racing games, sports games, movie tie–ins. Owning a PSP is just like owning a PlayStation only smaller, and while I can see that for some people that's exactly why it's great, for me it's just completely uninteresting. But back to the DS. It took a while for a range of interesting titles to emerge for it, but before Christmas I started to hear great things about games such as Advance Wars, Animal Crossing, Mario Kart, Sonic Rush, Kirby Power Paint, Meteos and others. Some of these games obviously aren't completely original, but they all offer something distinctive on the DS that hasn't been done before; Mario Kart, for instance, has managed to include genuinely seamless wireless multiplayer gaming which just works, even over public wifi access points. Sonic Rush plays across two screens simultaneously. Kirby Power Paint is a platform game which is controlled by drawing and tapping rather than the conventional joypad approach. They all feel fresh, different, innovative. And that's worth much more than a high gloss case or a big screen. Fun diversion for a Friday afternoon. 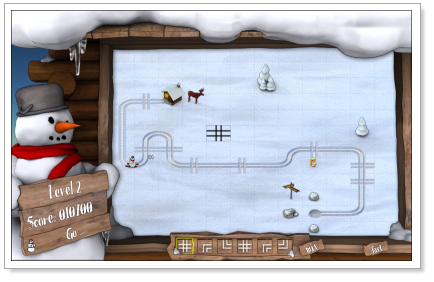 In this very cartoonish Flash game, your job is to launch Bob from one platform to the next. You give him a direction and speed and set him going, and he flies in a beautiful parabola, ideally landing exactly where you want and picking up some stars along the way, but more often hurtling into space or plummeting off the bottom of the screen. There are a few tricks you can use to make life easier, though: Bob bounces off the left and right hand edges of the play area, so you can overshoot and bounce back. And you have a limited number of airbrakes, so if you miscalculate horribly, you can tell Bob to abandon his graceful arc and drop like a stone straight down from where he is this instant. Eminently suitable for the older, slower gamer out there who needs a few seconds to plan his next move (cough, Tilbury, cough). But lots of fun for everyone else too. Update: seems the web site owners don't want people to link directly to the game, so you now have to go via their home page; the link is at the bottom right of the page. I have a soft spot for these games where you lay down pieces of pipe or track to make a workable route for water to flow or a train to run or whatever. In this case, appropriately enough given the weather, you're making tracks through the snow for a snowman on skis to travel along. Cute. It's a very simple game, requiring little in the way of fancy hardware and even less in the way of programming skills, and for that reason it's a popular choice for people who are just starting out writing games, or for platforms which have limited functionality – PDAs, mobiles, web browsers, etc. There must have been a hundred versions since the original came out, some with cool new features of their own, some just straight copies. It's nice to see something done so long ago having such a great afterlife, and since it made a ridiculous amount of money for me, it seems churlish to begrudge other people their crack at it too. I hadn't come across The Escapist before but it's an interesting read on the subject of (video) game development. I particularly enjoyed this article on the subject of why developing smaller, indie games is a better bet both financially and as a career than working for (say) EA. I could make two or three games each year instead of one every two years, for a cost of thousands, not millions. I'd work alone or with a couple of others, not on giant teams rife with politics. I could be my own boss, pick my own projects, own my own intellectual property, set my own hours, and do the marketing right, instead of coping with my idiot publisher. I could do something weird and innovative instead of just tweaking ten-year-old gameplay, and reach an audience ten times as large. My games might sell for years, not months, so I could actually polish them instead of shipping an untested beta in time for Christmas. People might play my games obsessively for months or years, not blow through them in ten hours and move on. And if I do absolutely everything right - which is under my own control - I could eventually earn two or three times my current salary. Or more. Personally. Of course, these are all "could" and "might". But there's something in it, I think. He's now made the presentation available online, and it's a great read; if you've been a games developer in the past, or you aspire to be one in the future (are you out there, Dan? ), you should take a look at this. If you're a games player who sometimes wonders why games are basically all the same these days, and why there are no blockbuster films that don't have a tie-in game, this presentation has the answers.